In America, if you get delivery from anywhere, your probably going to get your food items via Car or Truck. However here in Korea I have noticed that nearly all delivery is completed by scooters. If you think about it, it’s a better investment to have 8 110cc scooters that can go 50mph rather than having one delivery car that cost the same. It seems the most popular Delivery Scooter Type is the CITI ACE 110. 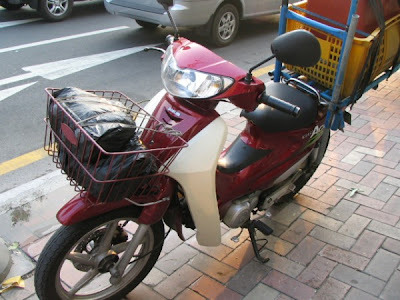 As you can see in the pictures below this bike is used as the Back Bone or the delivery industry in Seoul, and most of Asia. It is generally a Copy of the Honda Super Cub, from what I understand most of the parts are interchangeable from Honda To Daelim. The average 4cycle 110cc scooter here gets about 90mpg, which is fantastic considering what gas cost here per liter. In my first few weeks here in Namhamsamseong I managed to find a 1995 Citi Ace 90cc. which did not run. The electrical wiring was torn open, the gauges did not work. So I just wired everything so it could run and that was it, unfortunately I am not familiar with the electrical system so I have no lights, horn, starter, or even brake lights. Which I guess does not really matter because the scooter was stolen from me about 2 weeks ago. Even locked up the thieves manage to get threw a tempered steel lock. The Thieves are persistent as Ants with a full compliment of tools and a torch. They will not stop once they see a scooter lacking parts. I have seen a scooter picked clean to its frame in less than a week. It is imperative to get a high quality lock, and perhaps even an alarm system on your scoot. Or make your scooter look crappy enough that no one will steal it. Back to the topic at hand. The scooters are the life blood of this city, without them here I am sure things would grind to a halt. However with use of the scooters, gas is cheaper due to the demand not being as high. 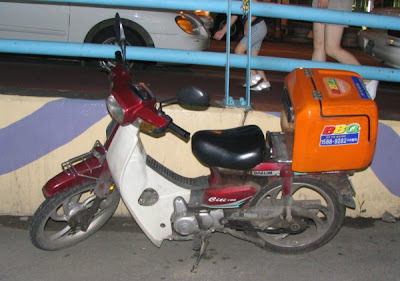 However if I had to suggest a well tested and tempered means of transport from Mail, Food, Stationary, Medicine and even taxi service I would go with the Scooter every time, It just makes more since to spend less money, and get better fuel economy.